Once the Easter break was over and I had finished working on notes following on from the European trip the pace began to pick up again. 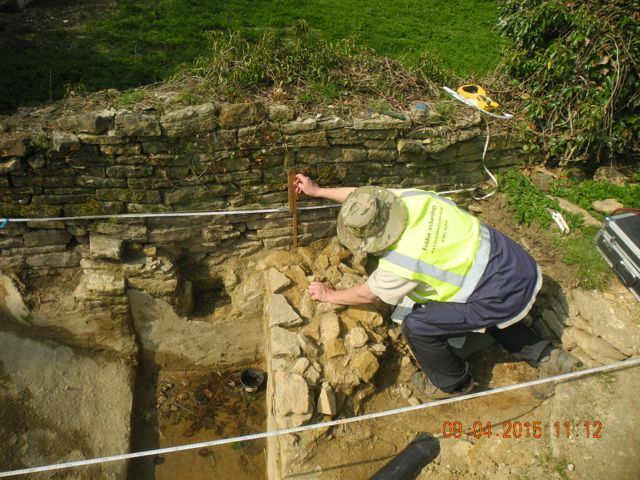 At Enstone a debate continued to rage concerning the function of our curious little cistern. Peter remained an enthusiastic supporter of the sheep dip theory, I remained unconvinced whilst struggling to come up with an explanation half as good. Anyway, irrespective of its ultimate identity it all had to be recorded so we co-operated on the drawing of elevations and plans whilst Robin began the task of cleaning up all our fragments of wall plaster recovered from the tank. The drawing begins, Peter starts work on an elevation plus a curious indentation in the rendering on the south east corner of the tank. The drawing finishes, Peter ends work on an elevation. plus a curious indentation in the rendering on the west side of the tank (looks like a setting for a beam or post). 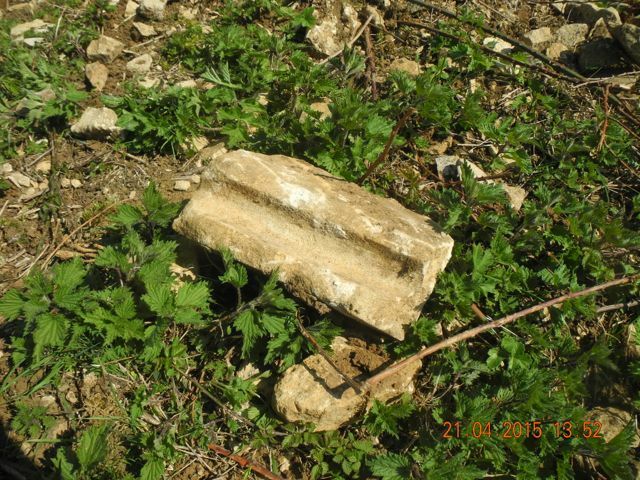 We had an opportunity to catch up with the landowner, Nick, and he told us of a piece of carved stone recovered from a demolished dry stone wall to the north of the barn, on examination this looked very much like the pier capping we photographed in the garden next door. 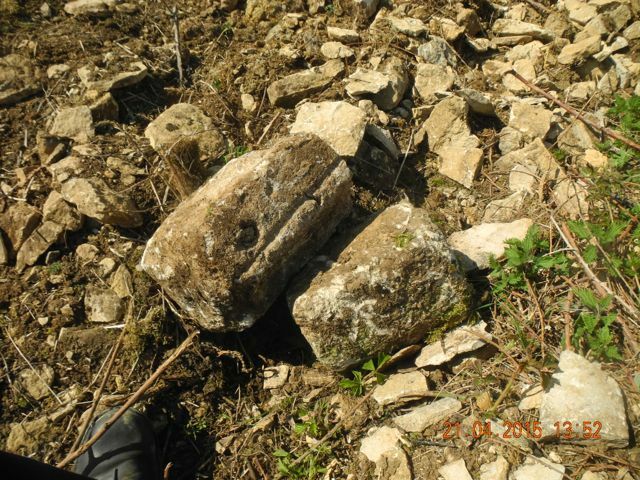 During a brief expedition to inspect the site of the discovery we came up with four more shaped blocks, two of them at least looking like seventeenth century mouldings and one of them sheltering a sleepy grass snake. It's hard to say which of us was most surprised, hence no photograph. back at the dig we were reviewing our stock of sculpture when the neighbours from up the hill arrived and after a brief conversation fronted up with a further piece of carving, this one reportedly left amongst a pile of rubble deposited following the last major restoration of the barn - sometimes it's just one surprise after another. 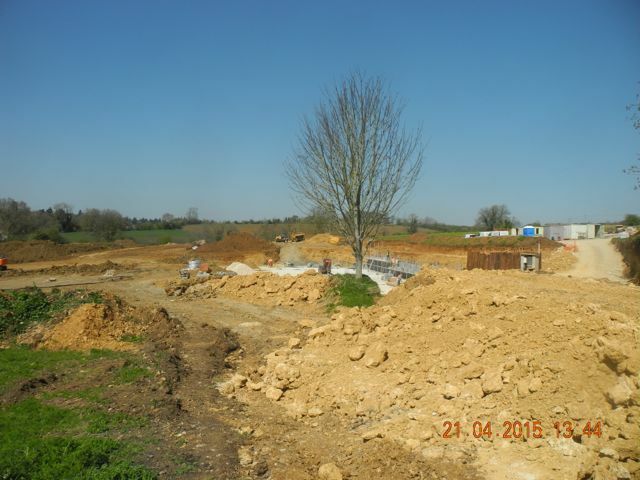 View looking north, the line of the wall ran along the top of the excavation to the right. The sculpted head, medieval from something like a corbel table I would say. It's funny how one can travel half way across Europe to visit sites whilst ignoring things on your own doorstep. 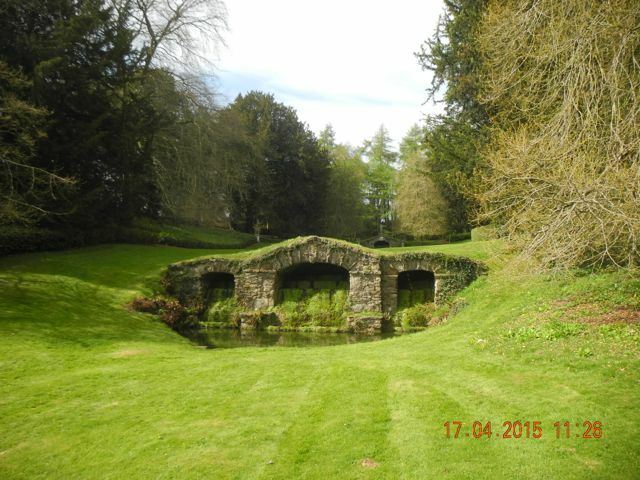 I hadn't visited William Kent's wonderful eighteenth-century garden at Rousham for twenty years or so but was fortunate to be shown round by the very knowledgeable and enthusiastic Michael Abbot who has worked on Rousham off and on over several years. It's a great pleasure to be shown round by someone who really knows what's what. 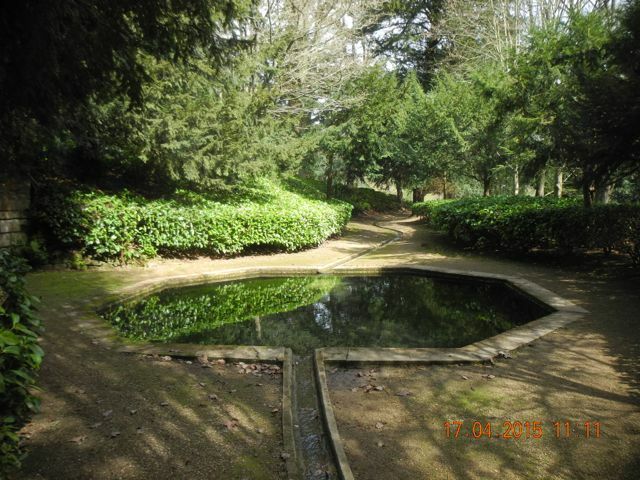 The Cold Bath and rill - or is it a meander - looking south. The Lower Cascade backed by... the Upper Cascade, looking north east. 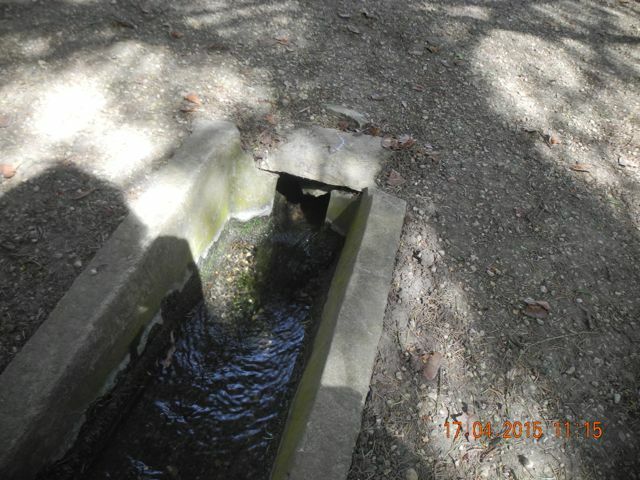 Water enters the system at the head of the rill and leaves it via a drain into the River Cherwell. 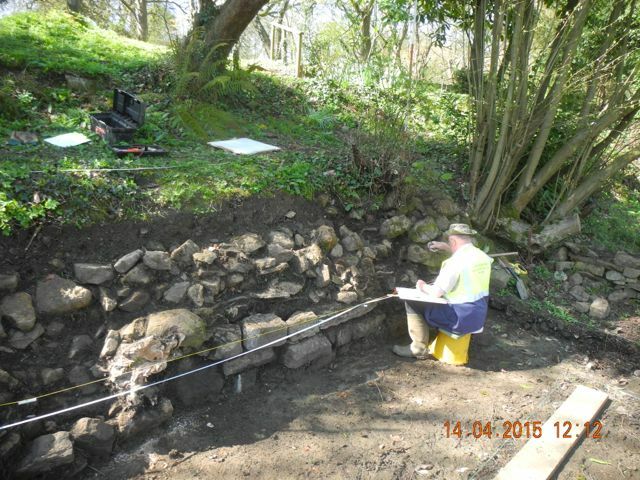 Work at Hanwell continued with the aim of finishing our study of the lake side wall and back-filling so that the lake could be refilled. 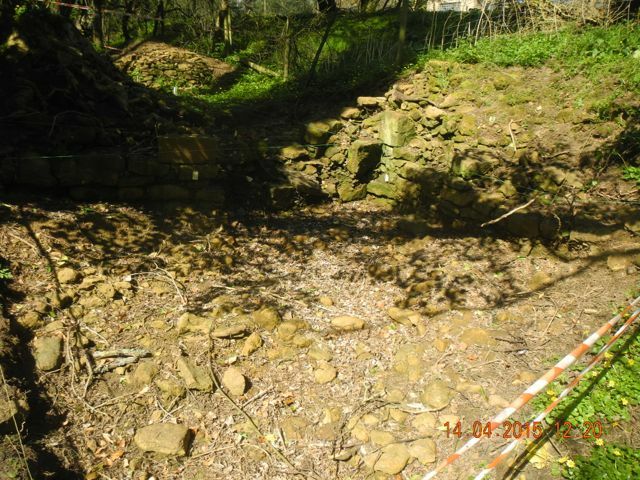 The difference in quality between this wall and the one on the East Terrace continues to be marked but once the drawing was finished we were able return to the Second Sluice and start the task of clearing the debris deposited over the winter with a view to resuming excavation on this crucial site and tying up all the loose ends before the Big Dig begins. Peter drawing elevations again - he does do other things. 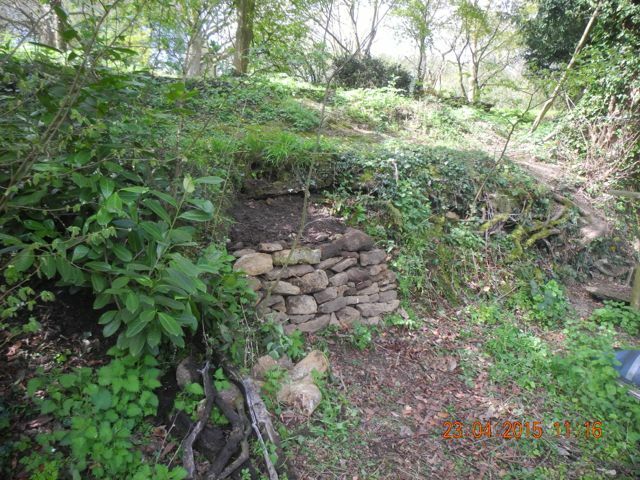 Down on the Second Sluice: before and after (thanks Geoff ). 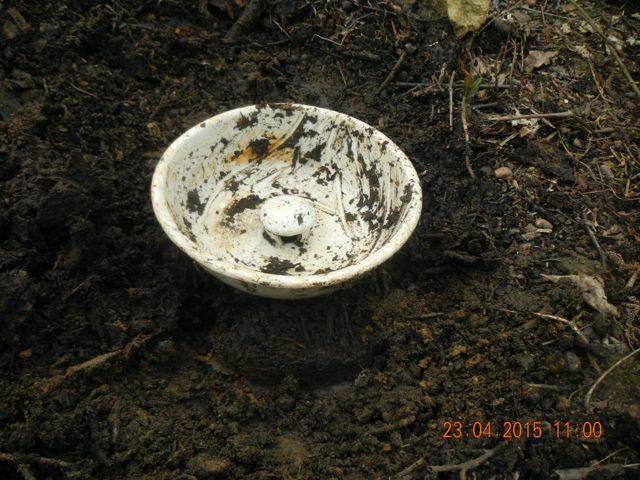 Further explorations on the lake side foreshore by Christopher revealed a splendid bit of sanitary ware, it looks like the lid from from a commode of some sort. We also had interesting conversations about the likely depth and profile of the lake as he has been undertaking a little probing. It's something we need to investigate right across the lake, perhaps by boat once it is refilled. All good things come to and end and hopefully a tidy end too so we worked quite hard to shovel back the spoil from the lake side excavation leveling it off and using the excess to fill in an eroded hollow behind our newly built retaining wall. Down on the Second Sluice we made a determined effort to press on by removing assorted spreads of rubble lest over from last year. 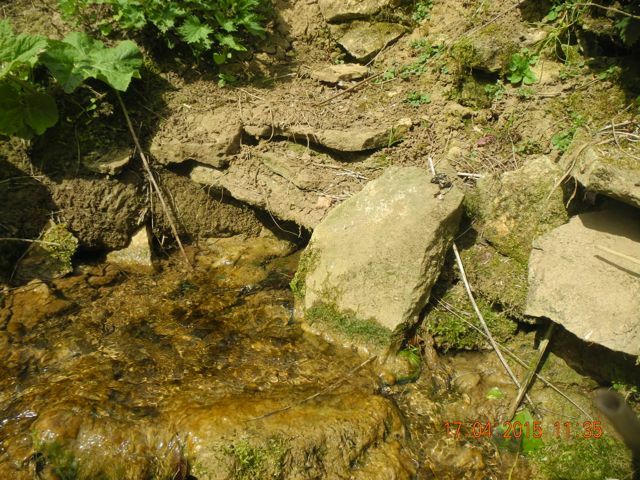 Down stream Peter was able to uncover what may be some internal structure to the cross wall plus the remnants of some potential paving whilst up stream I was following the line of the wall into the dam to the south. 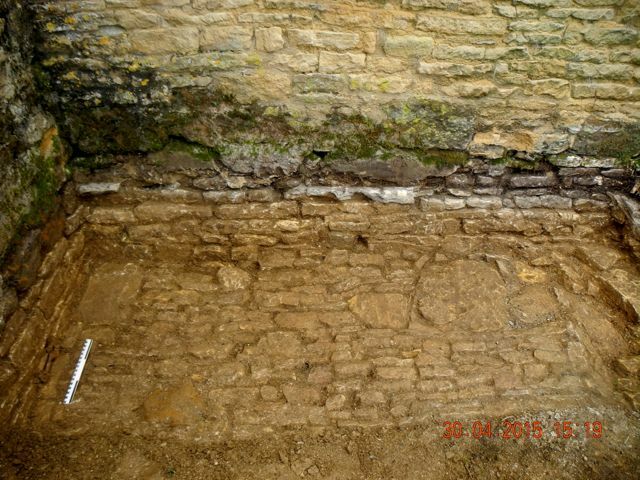 As assorted hill wash and more tumbled rubble was removed a secondary wall of limited length and on a slightly different alignment appeared. there seems r to be a lot going on in a little space. 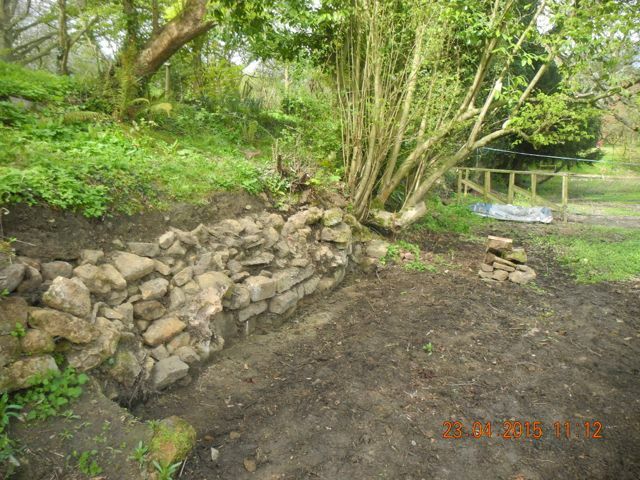 Making a tidy end to it all, the lake side wall looking south west and our new retaining wall just beyond it. The rough blocking wall is marked by the line of the string but you can see a wider wall on a slightly different line below it plus Peter's paving perhaps. 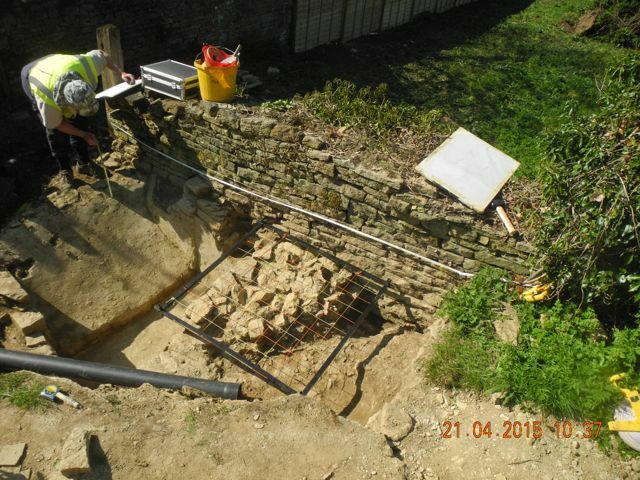 Although we had pretty well completed the excavation of our cistern digging continued either side of it trying to answer questions as to whether the break in the terrace retaining wall was an original feature and where the seventeenth-century ground surface was. 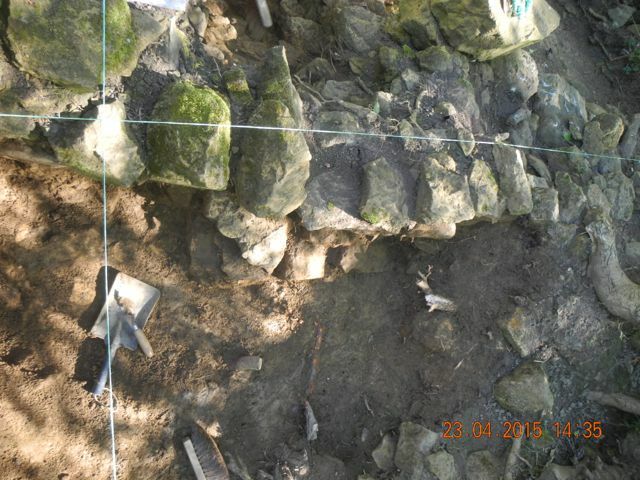 I think we have it in the photograph below where there is a mortary spread ( centre ) cut by the construction trench for the wall ( to the right ). 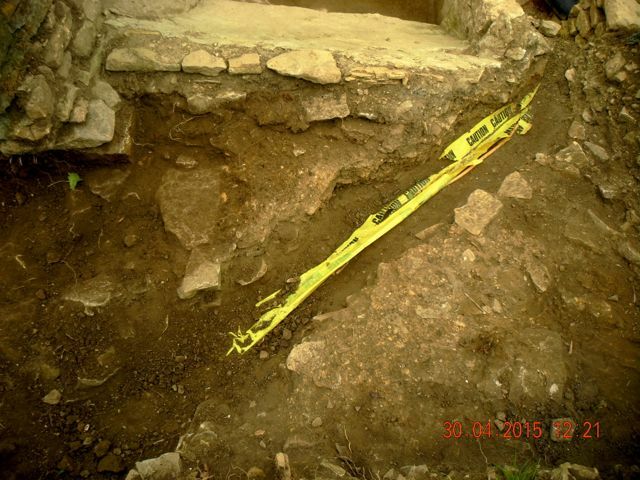 Unfortunately the picture is complicated by the recent yet still mysterious trench to carry an oil pipe from where to where remaining unknown. The area south of the cistern, looking north. 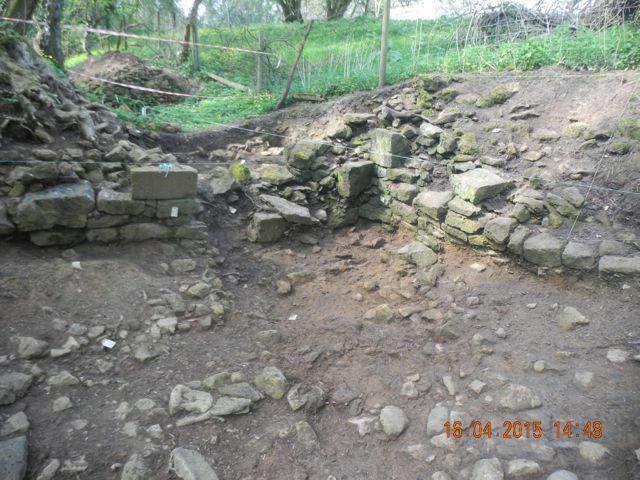 However, the really remarkable thing that came along towards the end of the month was uncovered near the barn. Contractors had been systematically clearing some of the more recent clutter that had accumulated in the yard next to the south side of the barn. 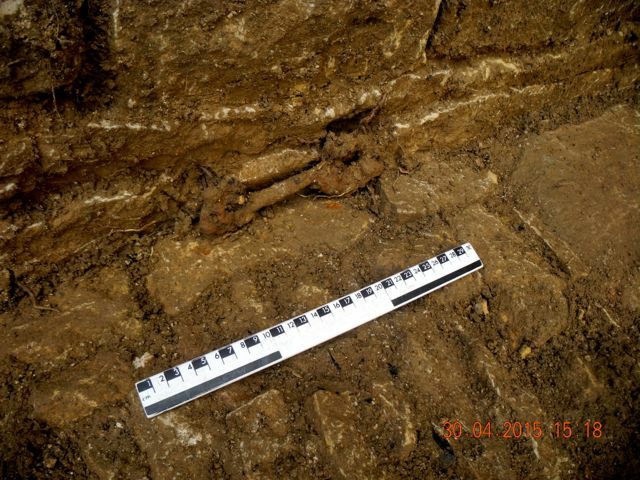 It was clear when we arrived that shoveling away a fair amount of topsoil had exposed the upper foundations of the barn itself. 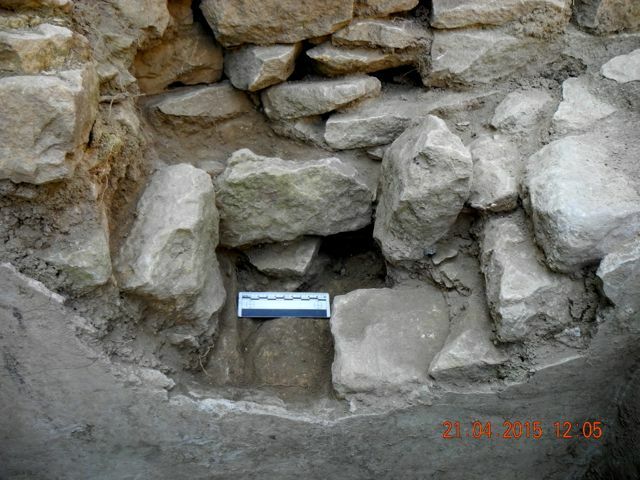 Although not strictly speaking germane to the research project we thought it was at least worth cleaning up the wall face and recording what was visible. 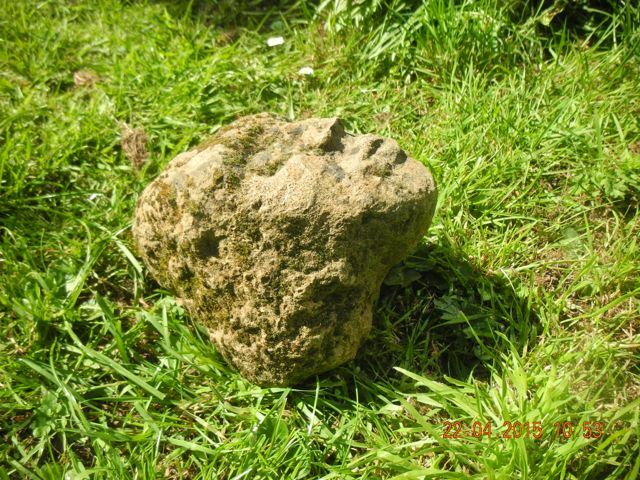 Once Peter started to remove the post- machining debris a well preserved pitched stone surface started to emerge. Interestingly this is some distance below the faced stones at the base of the buttress suggesting perhaps it is a later rebuild. 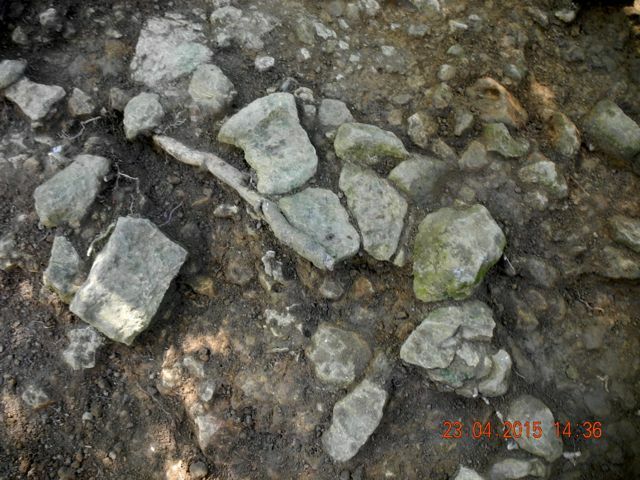 We had some pottery and glass from immediately above the cobbled surface suggesting that this section was last exposed perhaps in the eighteenth century. 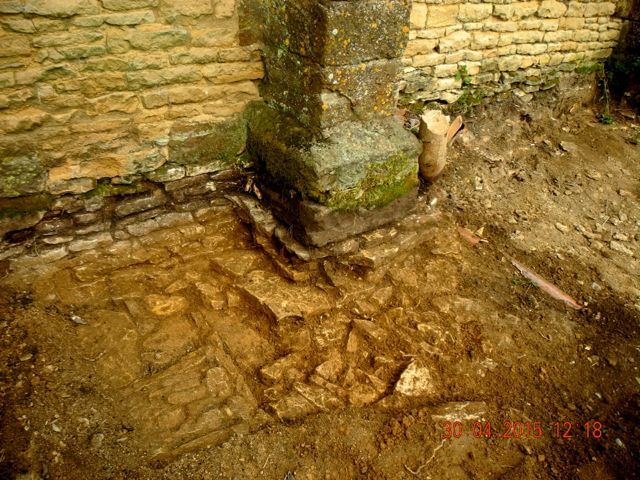 The truly remarkable discovery, however, was of a large iron key nestling at the foot of the east wall of the south porch, to all appearances left there, perhaps under the proverbial stone, and forgotten about! Peter believes it to be fourteenth century in date but further cleaning and possible x-raying will make this clearer. 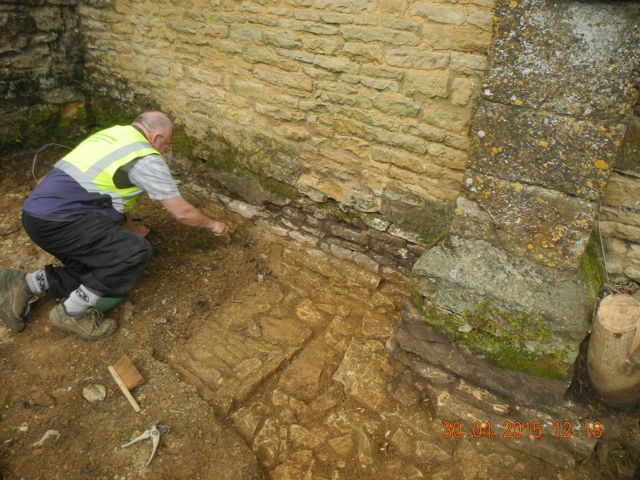 Peter sets to with a will removing I 001, curiously the surface adjacent to the buttress is quite badly broken. Views looking north west and north east. 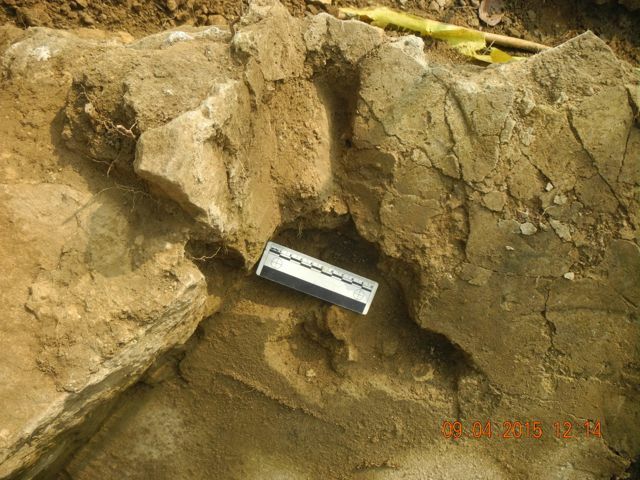 The area exposed by the end of the day and the key in situ pressed up against the porch wall. Views looking north and north west.